Nailah has studied and performed the art of Middle Eastern belly dance for over 30 years with national and international dancers and venues. 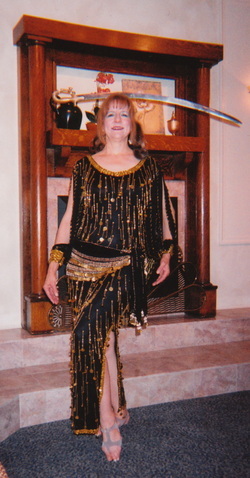 In the Summer of 2008, she traveled to Egypt to attend the Ahlan Wa Sahlan dance festival in Cairo. She studied with Egypt’s greatest dancers, Dina, Randa Kamel, Mona El Saeid, Dr. Mo Geddawi and Regaey and had the pleasure of dancing a solo on a Nile River cruise ship. She has been accepted to instruct for the past twelve years in the Special Studies department at the esteemed Chautauqua Institution in Chautauqua, New York where she was featured in their advertising campaign. She has danced before their prestigious Dance Circle, the first non-ballet person to do so and has been featured in The Chautauquan Daily newspaper and on Jamestown radio. She has presented workshops and dance seminars at women’s wellness retreats around the country and has taught at Lakeside, Ohio as well. A world traveler, Nailah has toured France, Italy, Greece, Great Britain, South America, the Seychelles Islands, the Caribbean, all over the United States including Hawaii, Canada, and Egypt. Nailah’s teaching experience began with private lessons and group seminars and has evolved into instructing at many dance studios and fitness centers in Northeast Ohio, including Cleveland State University and the YMCA. She dances professionally at family-friendly venues, incorporating cane and sword in herAmerican Cabaret and folk routines. She is the former director of The Cleveland Oasis Dance Company. She is American Red Cross CPR/AED, Standard First Aid, Group Fitness certified and Advanced Reiki, among others. She danced at various venues with local world music band, UZIZI. In her “other” life, she is a multi-published writer and women’s fiction/romance author. She has instructed writing at The Chautauqua Institution and through local adult education.